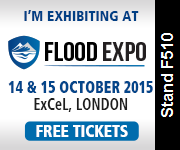 We will exhibit at Flood Expo in October. The world’s largest flood prevention exhibition and conference. The exhibition presents solutions to widespread flooding problems from the UK’s leading flood prevention companies, alongside an extensive seminar and workshop schedule highlighting new, cost-effective ways to prevent and manage floods.